Do you have magnets on your refrigerator? Since our refrigerators are probably one of the largest magnetic surfaces in our homes, to a lot of us, it only makes sense to use that space for creating some inspiration. Many years ago, I started a magnet collection. I have a magnet from every country I’ve visited during that time. I always look forward to going to the airport gift shops and choosing one. Now whenever I go to my frig and see my magnets from Panama, Canada, China, Mexico, Costa Rica, The Bahamas, etc… I am flooded with fun memories. Some people choose to add a little technology to their refrigerator magnets. For example, these iPhone app magnets are cute, and these Photoshop magnets are super creative. Now you can power-up your refrigerator magnets even more with this set of 48 Super Mario magnets. 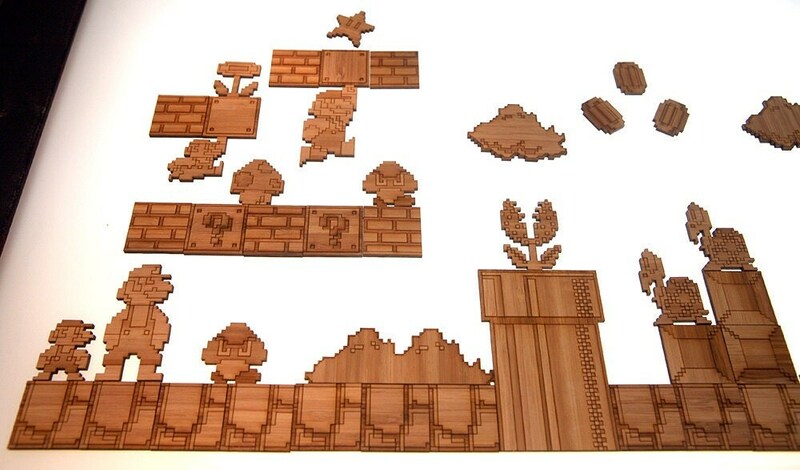 Travis Chen designed this set which includes everything you could possibly need to design your own Mario levels on your frig! He didn’t make these out of some flimsy plastic either; he handcrafted each piece from natural bamboo. This set even comes with one custom Mario power up! All you have to do is tell him what you’d like, and he’ll design it so it matches the rest of the set. If you would like to read about what exactly those 48 magnets are, and how it all goes together, you can check it out in his Etsy store.